Green tea matcha powder is like the super hero of teas. 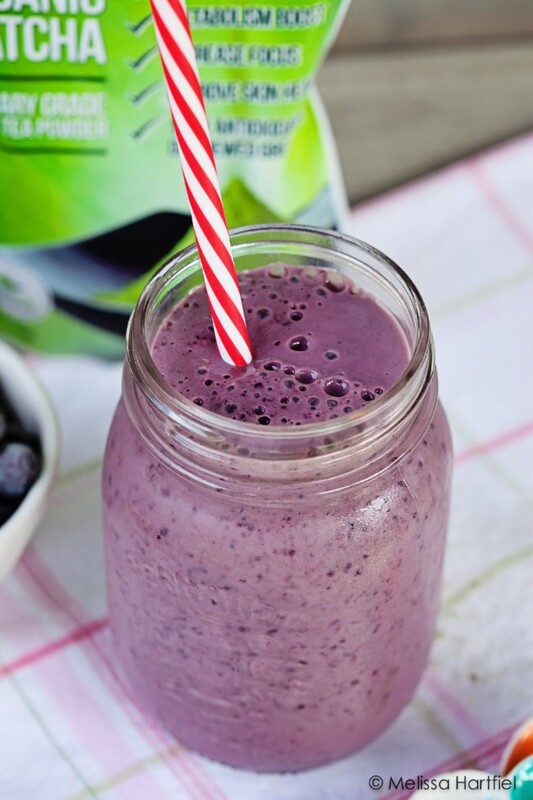 Add it to a breakfast smoothie to get a jump on your day! I drink green tea by the vat. No joke. Obviously, it’s the drink of choice when you sit down for a sushi lunch, sushi snack, sushi dinner… and if you live on Canada’s west coast you eat a lot of sushi. So ipso facto, you drink a lot of green tea. I buy it in giant bags at a little Japanese grocery store nearby. It’s so cheap and it’s the kind with the the toasted brown rice in it (technically it’s called genmaicha but I call it the popcorn tea!). In winter, I’ll literally drink 2 or 3 cups a day. But that’s a whole other post. I’m also a big fan of matcha – green tea powder. It’s a rare treat because it can be so expensive. A lot of energy goes into producing it (I had the opportunity to see matcha powder ground at 05 Tea Bar – it was so beautiful!). Recently Kiss Me Organics came out with a bag of Matcha Powder (affiliate link) that’s available exclusively on Amazon (Oh YAY but amazon.ca is finally branching out and improving their Canadian food and special ingredient offerings!). I had the opportunity to try it out and see what I thought. This matcha green tea powder is 100% USDA Certified Organic and comes in a 4oz bag for $29 CDN. If you’ve never seen matcha powder, it’s a beautiful brilliant green – it makes you happy just looking at it, never mind tasting it! Green tea has long been hailed for its high levels of anti-oxidants and health benefits. Matcha is a much more concentrated form of green tea and carries all the same benefits but in a much much smaller amount. The scent surrounded me the minute I opened the bag (I like that it’s easily resealable to keep it fresh and to stop the aroma from mixing with my other teas). Matcha has a very strong smell (I love it) – like a very grassy tea. That grassy flavour comes out in whatever you use matcha in – far more than brewed green tea. The first thing I made when I received my bag was a matcha latte. I was going to use that for this post but, I don’t have a milk frother and… well… it just looked sad without the frothy milk. But, it tasted perfect! I’ve been making them regularly since. I also decided to try it in smoothies now that the weather has gotten so ridiculously hot (we’ve been in the middle of an official heatwave) and lattes aren’t doing it for me. Mixing the matcha with blueberries, honey, vanilla soy milk and a banana was a little bit of heaven. Blueberries and matcha compliment each other very nicely! blend until smooth, pour into a glass and add a straw! You need 1 cup of liquid - it can be all soy milk, almond milk or regular milk or you can mix and match. Whatever you prefer! I’m really enjoying the Kiss Me Organics Matcha Green Tea Powder (affiliate link). The quality is high and the value is good for the amount. This gets my Friday Tea & Chocolate stamp of approval and I’ll be purchasing it again in the future. Disclosure notice: I was given a package of Kiss Me Organics Matcha Green Tea Powder for review purposes but as usual, all opinions are my own. I if I like it, I say so, if I don’t like it, I also say so! This post also contains affiliate links where noted. It was so good but I prefer without honey since it is already VERY sweet with the banana and blueberry. Thank you and the pictures are awsome!